When I was in high school, I had a classmate whose family owned a local fish market. They were known for selling the freshest seafood at affordable prices and it didn’t hurt they were the only game in town. I enjoy seafood, and I absolutely love lobster. One day I was talking to two of my girlfriends about how much I love lobster… hot and dripping in butter… a salad and a baked potato – pure heaven. We were all in agreement about the pure heaven part and before we knew it, I was driving my baby blue Chevy Chevette to the fish market so we could score some lobster. It is easy to cook, right? I mean, just boil it. It is sort of sad, though, don’t they scream? We talked the entire way there, feeling rather adult-like while convincing ourselves we could certainly prepare a delicious lobster dinner. Once inside the fish market we were taken aback by the overpowering smell. Okay, so fish smell… but lobster dinner, totally worth it. 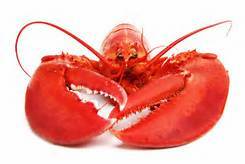 We selected three lobsters with the care one takes in purchasing a new vehicle (not that I would, I mean, I owned a Chevette!) and smiled as we handed over our hard-earned cash. They gave us a brown paper bag containing the lobsters and not one of us extended an arm to grab it. Reluctantly one of my friends finally grabbed the bag and carried it at arm’s length, as if it contained a boa constrictor. She placed the bag on the back seat, I started the car and we were on our way. We were laughing and talking, as teenage girls do, giddy with excitement over the feast we were soon to prepare. “How long do you think we have to boil them for?” I asked. “Until they’re red.” My friend in the passenger seat replied. Suddenly, my friend in the back seat let out a blood-curdling scream. I slammed on the brakes right in the middle of Route 1, a busy, well-traveled road. “They’re getting out of the bag!” She yelled as she swung open the car door. We all screamed in unison and fled the vehicle leaving all of the car doors open. “Oh my God! What are we going to do?” My friend yelled. “I’m not picking them up!” I said, as I felt a shiver run down my spine. Cars were stopped behind us as the people driving in the lane to the left of us slowed down to see what all of the commotion was about. “They’re trying to crawl into the front seat!” My friend bellowed, and we all started to shriek again. I was panicked about the loose lobsters in my car. I liked them better when they were in the bag, which I intended to dump them from into a boiling pot of water I thought as I saw the flashing lights of the cop car behind us. “You can not stop and abandon your vehicle in the middle of a busy road like this,” he instructed. “Well, the lobsters are out of the bag,” my friend stated, looking like she was going to start to cry. The traffic was mounting around us. The officer looked into the vehicle. He never even asked to see my license or registration. He simply picked up the lobsters, put them back into the brown paper bag and rolled up the top. “Go straight home,” he said, and we got back into the car. I never drove so carefully or with as much anxiety, as I did that day. To this day, I have never purchased another live lobster from a fish market, and not because I wouldn’t like to. I just think that it would be better if I got them an UBER. I can just hear the conversation back at the police station. “Hey guess what happened to me today… And if they had a contest for best story, I bet this one would be close to the top! I totally believe that cops have this competition. Glad that I could make you laugh! All the time!!! How’s that leg of yours? It hurts, but I’m working like a dog. Thank you fr asking. Hope you can get it taken care of soon! Hugs n prayers! I’m still seeing the prom pix in my head! Such a flawless moment! I’m going to wait and see what happens with my knee. Right now I have to make money for my family. Kevin and Anna are so in love! It’s sweet! I think that their prom photo captures that. What is Ellen up to anyway? Lol! Ellen SHOULD be up to reading your blog!! ha! Thanks Roda! As I always say, funny cuz it’s true! Awww, thank you Roda! I appreciate that!! The lobster part jumped out at me!